This summer turned out to be a bit of a boon for hard rock/metal fans. For our listening pleasure we got a long talked about, long awaited record from the mighty Priest. Lemmy and crew gave us their 24th album. And shock rock legend Alice Cooper weighed in with a new record of his own. Metal love all around, right? I've been listening to Judas Priest for a good long while. Like with everything, I go through periods where I listen to them more than other times. This year I listened to a lot of Priest and thus found myself thinking tha t perhaps I should check out Nostradamus when it was released. 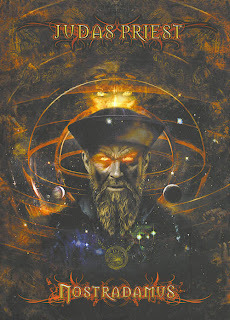 For those that don't know, Nostradamus is a concept album. They've gone and put Nostradamus' life to song. That right there made me leery and almost prevented me from purchasing it. One, I don't like concept albums and two, I really don't give a wit about Nostradamus. But, it's Priest! Because I like cute, I picked up the deluxe edition of this two CD opus instead of your standard jewel case edition. It's a very nice package too ... 48 page hardbound book with the lyrics. Great package. Looking at the track listing, Nostradamus looks a wee bit daunting. There are 23 tracks on this puppy! Yeah, that's a lot of Priest but, some of the tracks are more interludes than actual songs. Nostradamus contains no arena rousers. What's that mean? In Quirky Chick speak, it means not once while listening to it did I say to myself "I can't wait to hear this one live!" There will be very few cliche horns in the air, screaming at the top of my lungs, giving myself a headache and or whiplash when one of these songs rolls around live. The biggest standout for me and the song most likely to make me go all cliche metal chick and whatnot is "Persecution." This one has one of those make your ears bleed guitar solos ... yeah, sweet. My second favorite track, the acoustic laced "Alone." Other standout tracks, "Prophecy," "Pestilence and Plague" and "Conquest." Title track, "Nostradamus," starts off with what sounds like Halford standing an audition for an opera before kicking into a blistering Priest romp. And this is a petty personal preference thing on my part but I don't like the word Nostradamus and frankly I find it a bit annoying hearing it blaring through songs. I wouldn't tell a novice Priest fan to run out and buy this record. It's too overwhelming and tedious. However, I would tell an on the fence Priest fan to buy it. Perhaps this will be one of those records that down the line, I'll pull out, listen to and fall in love with. Right now however, it's the relative you're happy to see a few times a year but you start yawning and hinting how late it's getting after a while. Motörhead is another one of those bands, like AC/DC, that you pretty much know what you're going to get when you buy one of their r ecords. Motörizer has the band staying true to form. That's not a bad thing. The difference between Motörizer and some of their previous efforts is they sound more inspired ... more energetic. Besides, Lemmy is one of those people you can't help but like. Lyrically, Motörhead has never been anything to write home about in my opinion. Lemmy's voice is even more graveled sounding if that's even possible! 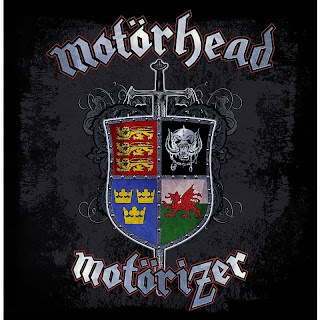 "Rock Out" and "Buried Alive" both have the what you would call the classic Motörhead sound. The music of "Back On The Chain" reminds me of "Damage Case" ... I keep expecting to hear it when I listen to this song. Other notable standouts, "When The Eagle Screams," "Time Is Right," "One Short Life," which has a blues vibe, and "(Teach You How To) Sing The Blues." If someone were to ask me 'should I buy the newest Motörhead record?' I'd say yes. I don't think anyone who likes Motörhead, even casually, would be disappointed in this record. 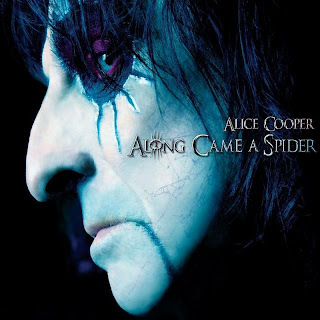 Alice Cooper decided to give us a concept album too ... chronicling a serial killer. I've already mentioned I d on't like conceptual projects. Add to that, I'm not really a fan of post 70's Alice. To be honest, when I was exploring music to listen to that I didn't inherit from family, I ignored Alice. Why? I felt he was a little too over the top cartoonish. I mean come on, I watched him on the Muppet Show for goodness sake! Yeah, I just admitted to watching the Muppet Show but let us not dwell on that. In hindsight, my assessment of Alice Cooper was outright hilarious considering some of the 80's hair metal I just couldn't live without back in the day. A bit older and a bit wiser, I found myself listening to classic Alice ... you know, back when Alice Cooper was a band and not just a man called Alice. Alice Cooper the band was a damn good band. Discovering this still didn't really have me showing much love for modern day Alice. Oh sure, there were a few songs here and there that I enjoyed but those didn't compare to the older stuff. But, I decided to buy Along Came A Spider and give it a chance. Of the three albums I've talked about this time around, I found myself liking Along Came A Spider the best. I think it's safe to say I found myself liking this effort because it sounds more like the classic Alice I've already professed to being a fan of. Dare I say I even found myself dancing around the room a bit while listening to this album. What's that? A danceable serial killer story? I can honestly say that I didn't once feel the urge to skip a track while listening to this record. There are but a hand full of records that came out this year that have that distinction. My favorite track on the album is "Killed By Love." Other highlights, "Wake The Dead," I'm Hungry," "(In Touch With Your) Feminine Side," which has a bit of a Stones vibe to it, and "The One That Got Away." If you like more of the classic Alice sound, then you'll probably like this record.